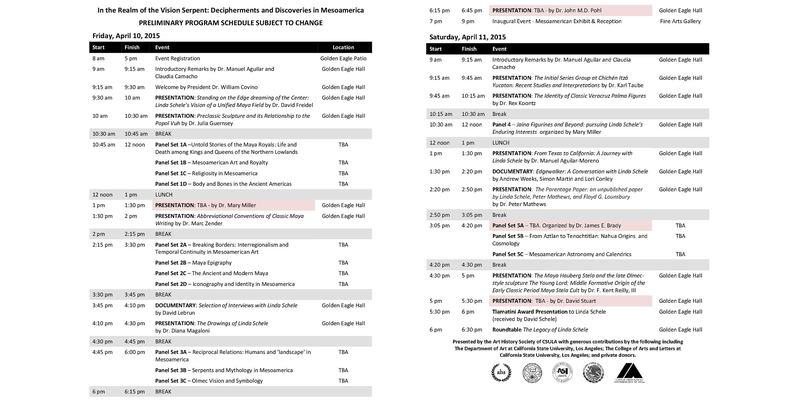 In addition to these highly regarded keynote speakers, there will be several panels composed of prominent experts in the field of Mesoamerican Studies as well Ph.D. candidates. Attendees may select panels or presentations they wish to attend. In the Real of the Vision Serpent: Decipherments and Discoveries in Mesoamerica, a symposium in homage to Linda Schele promises to be CSULA's largest Mesoamerican Symposium to date. All attendees and participants are also invited to the inaugural viewing of a special Mesoamerican Art exhibit in the Fine Arts Gallery at California State University, Los Angeles after the closing of Friday’s symposium presentations. The title of the exhibit is: Eternal Realms of Revelry: The MAW Collection of Pre-Columbian Art. For additional details regarding location, price, and registration, please visit the AHS Website or contact ahscsula@gmail.com.